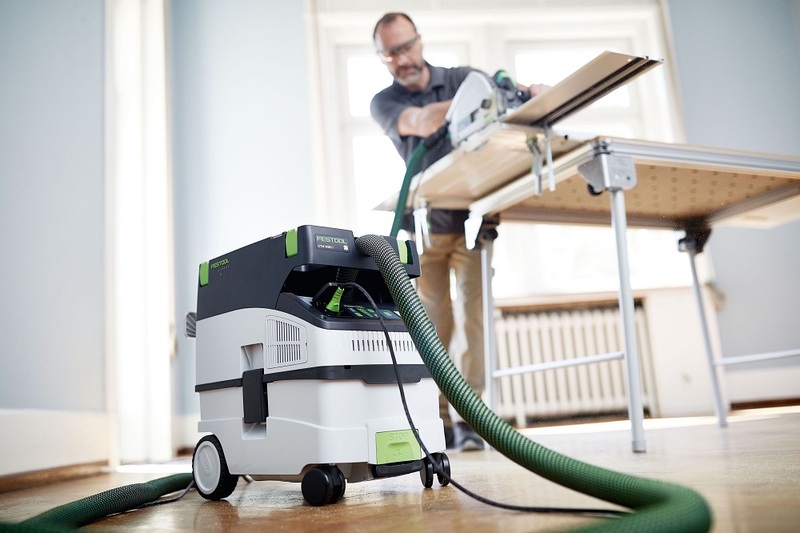 Phil Beckley, Technical Trainer at Festool, answers a question on the importance of using a dust extractor and keeping safe on site. I understand that breathing in dust from drilling, cutting and sanding is a huge health risk to myself and my colleagues, however the practicalities of keeping dust to a minimum on site aren’t always straightforward. Extractors are a great tool for reducing the amount of dust, but they can often be heavy and awkward to move from my van to the job. I also have to take multiple trips to bring all of the equipment that I need for a job onto site. This can be time consuming and not only increases my labour times, but causes greater disruption to the client. Secondly, cleaning out the extractor can be a real task. Although the work area is kept cleaner, emptying the extractor can sometimes lead to dust escaping, causing additional mess and the potential risk of me breathing it in anyway. Do you have any advice on how I can make the dust extraction process easier, whilst still ensuring that I am not breathing in harmful particles? As you are well aware, dust extraction is incredibly important for people working within the construction industry. The smaller the dust particles, the more harmful they can be, as they penetrate further into the lung tissue. Over time, exposure can lead to serious illnesses including asthma, silicosis, cancer and chronic obstructive pulmonary disorder. This is why it is so important to have a means of dust extraction on site. And Festool’s user-orientated system may be able to help you with an easy and efficient solution to your problem. With portability a key requirement for you, it may be that the CTM MIDI is the answer. The extractor can contain up to 15 litres of dust and works on both dust types L and M. Just 470mm in length, 320mm wide and 495mm tall – the unit is our smallest extractor for hazardous dust particles in dust class M. In total, the extractor weighs just 11.3kg, ensuring that it can be lifted effortlessly from the van and its small size makes carrying it to the working area simpler. 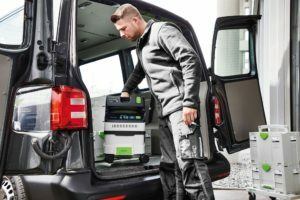 Designed in line with the SYSTAINER T-LOC coupling, the extractor can be easily locked together with other Festool, and a total of 40kg of equipment can be stacked on top of the CTM MIDI to further ease transportation of tools and equipment onsite. Keeping to the system can improve the set up and pack down processes, meaning that the time spent on these tasks is reduced. Cleaning the CTM MIDI is also simple. The extractor allows the user to change the main filter from outside the main body of the unit. This means that the lid does not need to be removed, which significantly reduces the risk you mentioned of breathing in residual dust during the cleaning process. The manual cleaning function also ensures that any dust build-up can be removed – this is done by pushing a lever downwards, which forces air through the filter, dislodging any dust from the filter and keeping the bag cleaner. This simple cleaning process can save you time, whilst also improving your onsite safety. The CTM MIDI works with 21mm, 27mm, 32mm, 36mm and 50mm hoses, which ensures that it can be used across a number of applications, as it is capable of extracting dust at varying rates. Automatic suction hose detection also ensures that the CTM MIDI is set to the correct hose diameter, which determines the amount of suction needed. As a focus on the dangers of dust inhalation and the importance of dust extraction increases in prominence across the construction industry, the technology and solutions available will also continue to evolve and improve, with leading manufacturers at the forefront.